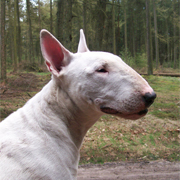 "Indian Dogs Breeder, Bullterriers en Dalmatiers"
My love for dogs and many years of experience are the basis of this website. I've had dogs my whole life and there are three dog breeds that I love absolutely. Three different Breeds, both in character and appearance. Despite the differences between the thee I've decided to combinate this breeds and this turned into "Indian Dogs" and related to this website. The decision to breed was made because I want other people provide a healthy, loving, loyal and beautiful Dalmation, Bullterrier or Miniature Bullterrier. All dogs get the necessary health test. Please feel free to explore the website and click on the links to get more information ofcourse you van always contact me personally.